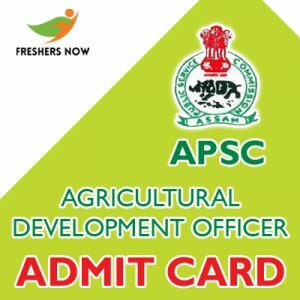 The APSC Agricultural Development Officer (ADO) Admit Card 2019 will be released in the month of March 2019 by the officials of Assam Public Service Commission (APSC). There are 148 vacant positions for the posts of Agriculture Development Officer & Research Assistant. Moreover, the examination will also be conducted in the month of March 2019. All the eligible candidates should download the Admit Card either from the direct link provided at the bottom of the page or from the official website www.apsc.nic.in. 1.4 Steps To Download APSC ADO Hall Ticket? The higher authorities of the Assam Public Service Commission (APSC) announced that the examination for the Agriculture Development Officer and Research Assistant will be conducted in the month of March 2019. Moreover, the admit card will be issued a few days before the examination. Therefore, candidates should download the hall ticket before the exam. Also, candidates should carry some mandatory documents to the APSC Agricultural Development Officer Examination 2019. The list of the documents is provided in the coming sections. Coming to the selection process for APSC Agricultural Development Officer Examination 2019, only the eligible candidates will receive the admit cards for the examination. Later on, candidates should attempt the written test. After the written test, aspirants who score the highest marks will be promoted to the next round i.e., Interview. The candidates shortlisted for the interview will receive the call letter. While attending the interview, candidates should carry the call letter along with them. Finally, the candidates selected in the interview will be placed according to the eligible post. Refer to this section for the complete information about the details present on the hall ticket. Aspirants are advised to check the details after downloading the apsc.nic.in Admit Card 2019. if any of the details are wrong, then make it rectified as soon as possible. The list of the important documents is in the same fashion provided below. While going to the APSC Agricultural Development Officer Examination 2019, candidates should take some important documents along with them. They are very useful during the verification process. Also, aspirants should keep in mind that you should attend to the examination venue before the reporting time. Aspirants who come after the reporting time will not be allowed to the examination. Have a look at the documents list provided below. Steps To Download APSC ADO Hall Ticket? There are few steps to download the APSC ADO Hall Ticket 2019. Candidates who find difficulty in downloading the hall ticket can follow the steps mentioned in this section. First, candidates should enter into the official website of the Assam Public Service Commission – www.apsc.nic.in. Now, the home page of the website will be displayed on the screen. On the home page, you can find the latest updates section. In that section, the flashing links will appear. Search for the desired APSC Agricultural Development Officer Hall Ticket link. When the link is found, then click on it. Fill the details in the form and click on the submit button. You will get the admit card download link. Download and take the hard copies of the admit card. We hope that our team had provided the complete details about the APSC Agricultural Development Officer Examination 2019 and about the APSC Agricultural Development Officer Admit Card release date. For more updates keep visiting our webportal Freshers Now. If any questions you can ask by using the below provided comment box.